@TC we are committed to empowering students to follow their passions. That is why in 2014, we started our Elite Sports Development Program (ESDP) with Basketball & Squash. Futsal was added to our program in 2016. The ESDP will allow elite sportspeople, or those who aspire to play at an elite level, to train intensively in their chosen sport under expert coaches. The ESDP is available to existing students @TC, as well as external applicants. Students within the ESDP are full members of the TC Community and students and parents are strongly encouraged to read the school prospectus and website to ensure that they are committed to the whole TC philosophy, not just to participate in the basketball or futsal programs. Applicants for the program will need to demonstrate their commitment to their studies, as well as their chosen sport. TC’s academic program requires high levels of independence from students and continuation in the ESDP will require students to maintain a high level of academic progress. We are delighted to have acclaimed Basketball coach, Ian Stacker to head up the overall program. The focus Elite Sport Development Program (ESDP) for basketball is on developing the individual skills, the understanding of the concepts of the game plus the team concepts of play necessary to play basketball at the elite junior level. The classes consist of skill development sessions, shooting sessions, game play, general fitness and decision making in 1 on 1, 2 on2 and 3 on 3 play. The school also competes in the school basketball tournaments conducted by Basketball Victoria – the Victorian College Championships, Champions Cup and the 3 on3 Challenge. 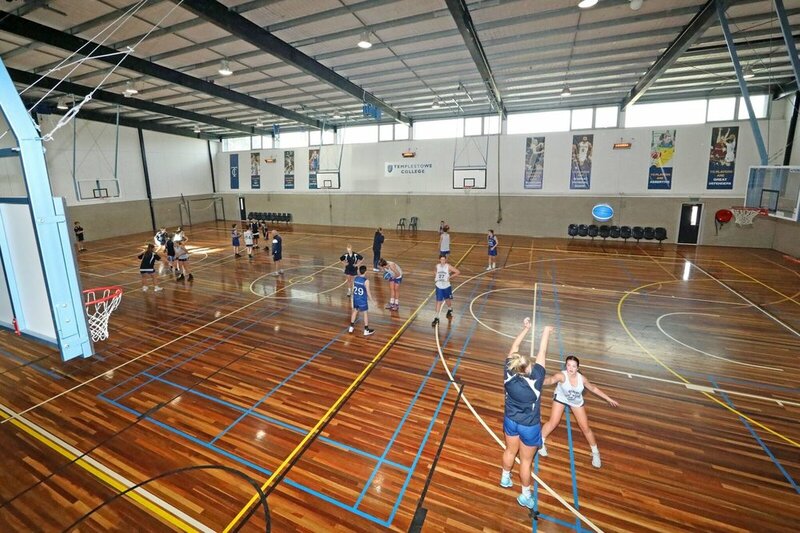 We also compete in the Secondary School Sport Victoria Regional competitions as well as friendly tournaments organised by schools within the basketball network. Templestowe College is one of only five schools which has a tier one status with Basketball Victoria as an official partner in the delivery of the elite basketball development pathways. The ESDP Basketball program utilises two blocks of the school timetable (six periods) Students in their final years of high school do one block of classes but have two early start 7.15am classes each week. In 2017 we took our first senior group on a tour to the USA and it is an objective of the program to take members of our graduating class on the tour to the USA every two years – the next tour is scheduled for 2020. In 2018 TC became a tier one partner school with Basketball Victoria to deliver the National Intensive Training Program. Leading our Futsal Program we have Australian Futsal Coach, Gui Costa. Currently the Head Coach of Melbourne Brasil Futsal Academy, Gui has lived in Australia for the last 15 years. He has coached 4 nations in the lead up to their Futsal World Cup campaigns including New Zealand, Australia (men and women), Samoa and Fiji National teams. Gui has coached in 3 World Cups and is one of the most recognised figures in Futsal in Australia. Our ESDP Futsal program has now grown to two groups, with former students having represented Australia at youth level. The ESDP Program is designed for those students who are either performing at a Rep or equivalent level, and who are aspiring to an elite level. Appointments to discuss entry to ESDP and the standard required should contact Wendy Harford wha@tc.vic.edu.au at the school. Ian joined TC having been the Head Coach of the Australian Institute of Sport’s Men’s Basketball Team, he was formerly the Basketball Victoria State Director of Coaching for 12 years, he is also a two time NBL Coach of the Year Award winner and a former Head Coach of the Gold medal winning National Young Men’s Team, just to name a few of his achievements. From 2017 onwards, our ESDP Basketball coaching team was joined by Alison Tranquilli. Alison, or Cookie as she is known, has represented Australia at two Olympics, winning a silver and a bronze medal. Alison works with our girls team to pass on her extensive knowledge of Basketball and the mindset required by elite Athletes.